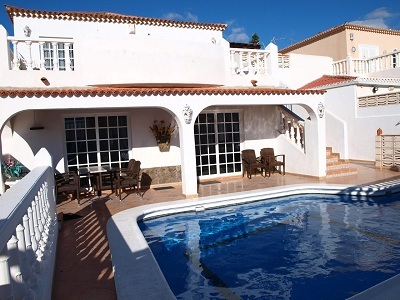 Villa Ambar is a three bedroom villa situated in the resort of Callao Salvaje in the South of Tenerife. It can sleep up to 8 people and has a private heated pool. Around the pool there is a large sun terrace, which is very secluded thanks to a high wall. There is also an upper sun-bathing terrace with sun loungers, which overlooks the pool and a covered terrace with patio table and chairs for alfresco dining. There is a large lounge with comfortable sofas and a TV. Two patio doors lead out from her to the sun terrace and an arch leads back through to a dining area. The kitchen is spacious and fully equipped including a dishwasher, oven, ceramic hob, large fridge/freezer and a central breakfast bar and stools. The master bedroom has a double bed and its own comfortable seating area, with patio doors leading out to an upper balcony, which enjoys sea views. Bedroom 2 also has patio doors leading out to this balcony and has 2 single beds. Bedroom 3 has a double bed. A deposit is required at the point of booking and the balance of the booking fee is payable directly to the owner on arrival.